install bolted or welded steel tanks. STS is a division of Superior Tank Co., Inc. and receives special pricing on new tanks saving customers money. STS holds contractor licences in California (#939335) and Arizona (#269751) and utilizes internal installation teams. The Superior Tank Solutions Annual Maintenance Program makes long term storage tank maintenance simple and cost effective. Our steel tank specialists will conduct a comprehensive tank inspection then develop a customized maintenance program based on tank needs and your budget. The Annual Maintenance Program can incorporate routine dive or dry inspection with written conditional assessment reports. In addition a wide variety of tank maintenance services can be included ranging from periodic washouts to full coating rehabs on a regular schedule. By encompassing all tank maintenance into a single contract the drawbacks of the normal “low bidder” process are eliminated. With the Annual Maintenance Program you can be assured of the quality of the work as the risk is transferred to Superior Tank Solutions. Also, it is not necessary to assess the work required then develop a project specification. In addition, the tedious task of reviewing and comparing bids is eliminated. 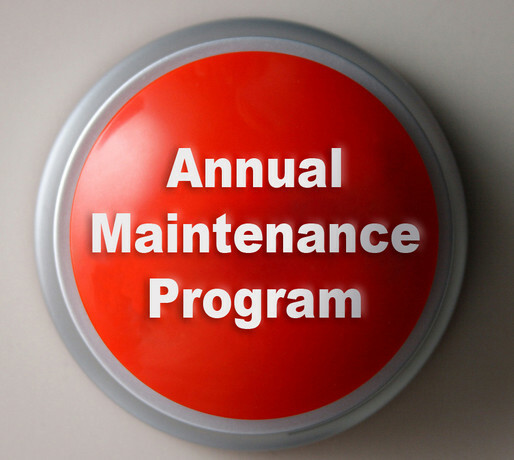 The Annual Maintenance Program also provides predictable and level maintenance costs to smooth out spikes in your operating budget. By combining multiple tasks into one contract, economies of scale can be gained thereby saving you money.